Cold form foil is a packaging solution for pharmaceutical products such as tablets & capsules and others. Extreme barrier properties of cold form foils are key reasons which is why cold form foil is witnessing great demand in numerous applications. Cold form foil, not only provides an impervious barrier to moisture, oxygen and other gasses, but also offers complete protection of the drugs, maintains the product integrity in order to show high tolerant compliance rate. 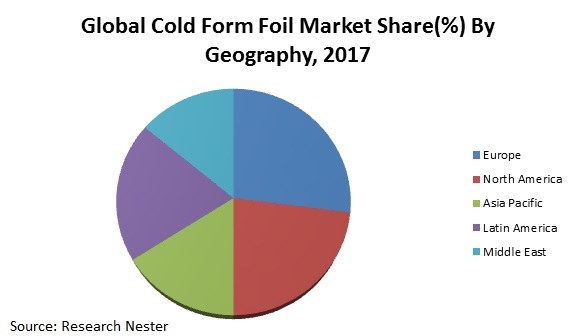 The global cold form foil market is expected to showcase a significant CAGR of 6.1% during the forecasted period 2018-2027. Additionally, increasing consumption of medicines and ability of cold form foil to protect medicines from water vapour, light, gases, aroma and others is intensifying the growth in the market size of global cold form foil market all across the globe. Growth of cold form foil market is driven by the growing demand for advanced medical products from the consumers and adoption of numerous healthcare programs in developing countries. Pharmaceutical companies are adopting cold form foil for packaging of numerous medicines on account of the presence of features such as excellent formability and high malleability. Cold form foil requires less energy for the formation process which further reduces the cost and carbon emission. Additionally, possibility of wide range of shapes and packages with cold form foil is increasing the demand for cold form foil all over the globe. Rising demand for cost effective and high quality packaging solutions across numerous industries such as pharmaceutical industries is propelling the demand for cold form foil market. Additionally, escalating adoption of packaging solutions that are able to augment the product shelf life is envisioned to enhance the growth of market over the forecast period. Moreover, increasing use of cold form foil in numerous applications such as packaging of consumer products, food and industrial products is a key factor augmenting the growth of market over the forecast period. Furthermore, presence of stringent regulation regarding packaging and labeling of numerous products such as food and other medical products (tablets, capsules, drugs, vials, ampoules, syringes or liquid products) isalso projected encourage the growth of market over the forecast period.